This one relates to the one thats above. Oh man, that one above cracked me up. Check out this one, I think it will come true in future. That spam mail oh yea it was funny, even as long as almost 10 minutes. Worth of watch definitely. Equally as entertaining as the first one. Just watched these two spam reply videos by James Veitch, brilliant! I am watching a Mark Passio presentation on the "Unholy Feminine" where he compares how TPTB agenda influences in women have created a neo-femininist movement. A very interesting and detailed presentation, well researched... and 4.5 hours long. I still stand amazed at what goes on in this world. (https://www.youtube.com/watch?v=FAU6ZjovmT8). In it, he shows a short video on gold diggers to make a point on women tends to seek powerful men--as symbolized by wealth. Cracked me up... particularly since I live next door to one of these women! What I was surprised about in this video was that the girl went back to the "boss" guy, right then and there. But thats the way their brains work in that kind of situation. I guess I hadn't seen one of those kinds in a very long time and thats why I was surprised. Nothing has changed in the last 10 years or so in that area. I thought they might've gotten more sneakier over the years about how they hunt their next victim, but nope. The same primitive behaviour can be seen in animals as well. Only difference being that the animals choose the physically stronger male. I have seen similar videos before too. This one serie called "7 Deadly Sins" from Morgan Spurlock there are these "sugarbabies" in one episode that are just the kind of gold diggers than in that video. There might be little difference between gold digger and sugarbaby though, but still the same dollar signs in their eyes. This one seems quite fitting. 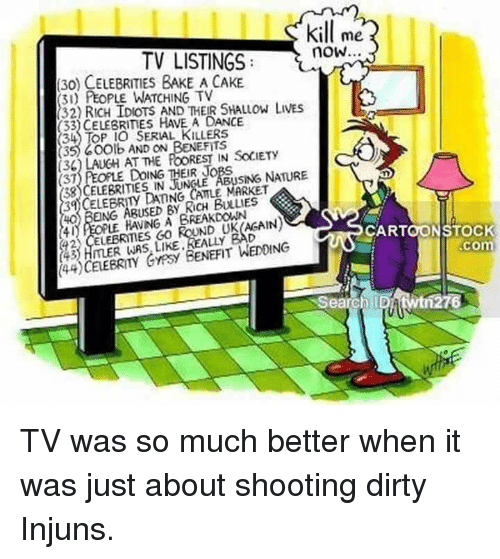 Funniest one I ever saw was back in the 1970s with "TV Guide," listing channels and shows... and it was an accident: "King Kong" followed by "Those Amazing Animals." I didn't know crocodiles barked! that is hilarious but also scary that not one single person was able to take the few required seconds of observation to see a rubber croc not moving naturally with four small legs under it... barking! I feel sorry for the wee dog, it just wanted to play and everyone ran away. When I first went to Alien War many years ago I knew it was a man in an Alien suit so just couldn't get worked up into a scared frenzy like everyone else. The actors playing Marines did a good job of setting the scene scare-wise but when the Alien warrior first appeared at the other end of a corridor in smoke and strobes, as everyone ran screaming I stood and observed the scene to get a good look at how authentic the Alien costume was, before my friend grabbed my arm and pulled me away with the others! It's amazing how people can get themselves so worked up that it blinds the senses. Unfortunately those in control knew this centuries ago and still utilize their old tricks to fool us today. Project Blue Beam should be a laugh when it happens, I can hear people now..."but you're into conspiracies, why are you telling us this is holographic tomfoolery, it makes no sense, look... Blue Avians!" I'm coming up on Level 62 in a couple of weeks... wow, that does sound a lot better! So I slammed her phone against the wall to kill a spider. Finally, a practical use for smartphones!! !